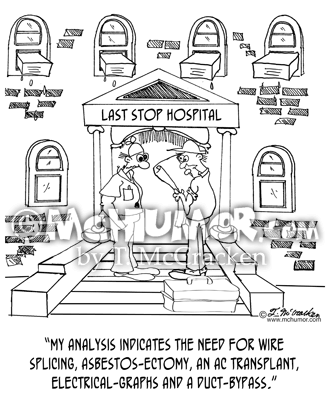 Hospital Cartoon 7328: A contractor looking at plans says to a hospital administrator, “My analysis indicates the need for wire splicing, asbestos-ectomy, an AC transplant, electrical-graphs and a duct-bypass." 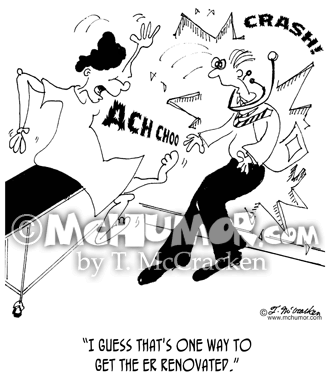 ER Cartoon 7326: A patient sneezing and blowing a hole in an emergency room wall. 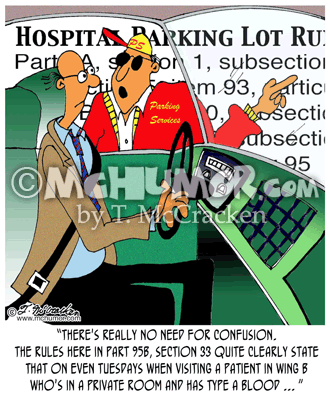 A doctor says, "I guess that's one way to get the ER renovated." 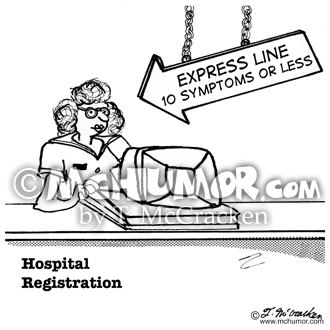 Hospital Cartoon 7117: At a Medical Records Office a sign says: "We don't let computers mess up your records. 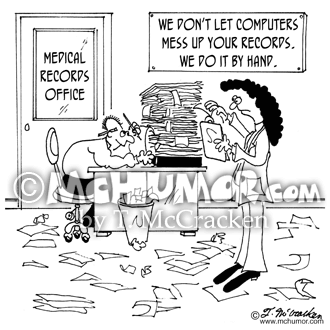 We do it by hand." 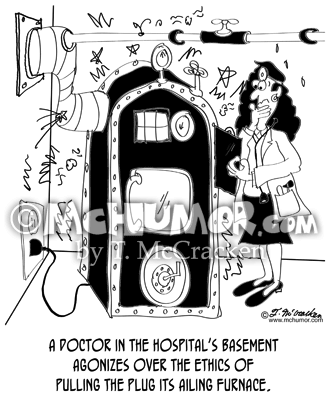 HVAC Cartoon 8687: “A doctor in the hospital’s basement agonizes over the ethics of pulling the plug its ailing furnace." 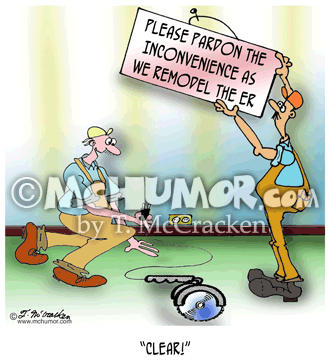 ER Cartoon 7325: A carpenter in a hospital about to plug in his circular saw yelling, "CLEAR!" 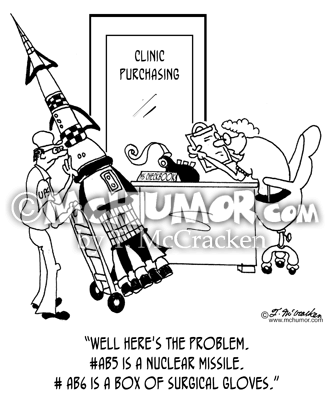 Hospital Cartoon 7327: As a huge missile is delivered to a clinic the purchasing agent says to the delivery man: "Well here's the problem. #AB5 is a Nuclear Missile. 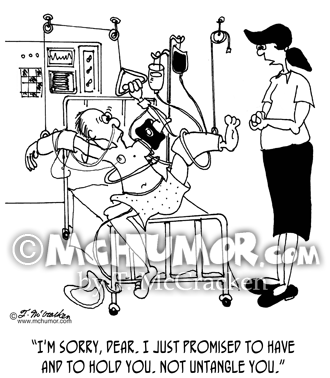 # AB6 is a box of surgical gloves." 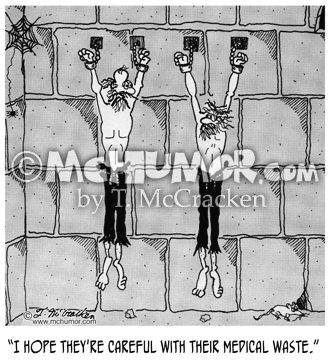 Hospital Cartoon 5764: A man hanging in dungeon says to his cell mate, "I hope they're careful with their medical waste."